Just like the pioneering bands of the 60’s in our genre combined musical influences in new ways to expand upon the existing formats, this wonderfully inspiring multi-instrumentalist folk/electro/indie/chamber/art rock band from Brighton merges the folk roots of Jethro Tull, the electronica quirkiness of Björk, the heavenly harmonies of Crosby, Stills & Nash, the inventiveness of radiohead, the heavy riffs of early King Crimson and Gentle Giant’s creative use of instrumentation. With every album release, Moulettes have redefined their sound and concept, shifting focus from charming acoustic folk songs with excellent vocal harmonies, via grandiose, cleverly orchestrated art-rock to the heavier electronica/prog concept album “Preternatural” (2016). The theme revolves around some of the surreal and bizarre creatures in nature and has received a 5 star rating in Time Out, 4 in Mojo and The Guardian, 8/10 in Uncut, while Prog Magazine described it as: “Huge, complex and compelling. One of the most thrillingly nimble musical ensembles the UK has produced in decades. Lead singer must be a national treasure soon… ”. Although much has happened since the Moulettes nucleus took shape right after the members had left college in 2002, lead singer/cellist/guitarist/main creative force Hannah Miller and drummer/guitarist/pianist/singer Ollie Austin have been a constant in the band, with bassist/guitarist/singer Jim Mortimore joining for their second album and Raevennan Husbandes on electric guitars/vocals/percussion in 2016. 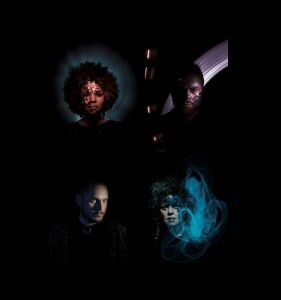 Moulettes have also toured with Three Friends, and not only share a musical heritage, but also a genetic, due to Jim being TF/GG drummer Malcolm’s son.